Download "AESF Aerospace / Airline Plating Forum - Tulsa, OK."
1 AESF Aerospace / Airline Plating Forum - Tulsa, OK. The following is condensed from a White Paper presented by C.T. (Tom) Philipp, P.E., at the Aerospace/Airline Plating Forum in Tulsa, OK. This paper demonstrates why we can be competitive with anyone, anywhere in the world, thru cutting unnecessary costs and reducing environmental liabilities, using today s technologies. Please take a minute to read these snapshot stories of 10 shops that have reduced their waste, enhanced their quality and lowered their operating costs. Lean & Green Manufacturing Lean and Green manufacturing involves many factors. 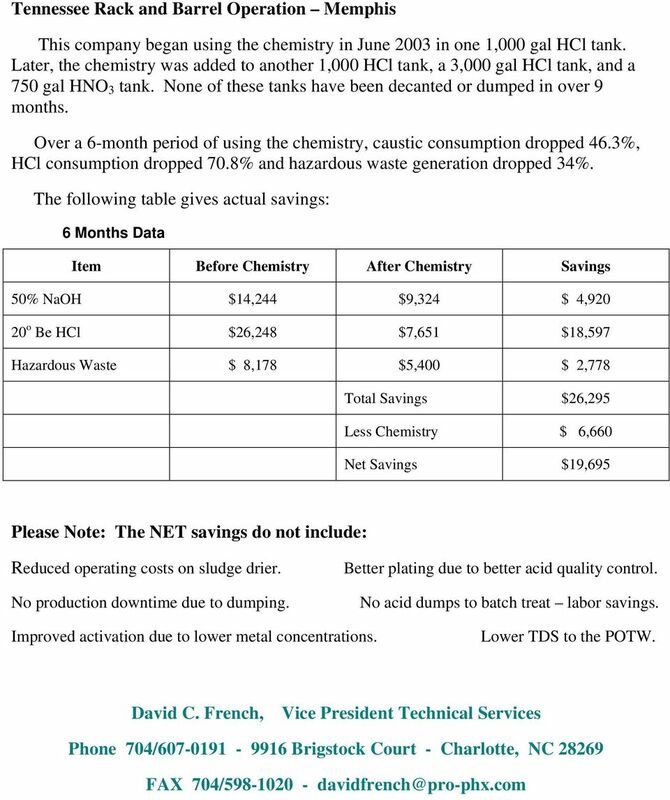 One of the most important factors is reducing the volumes and costs of chemicals used in the production process. 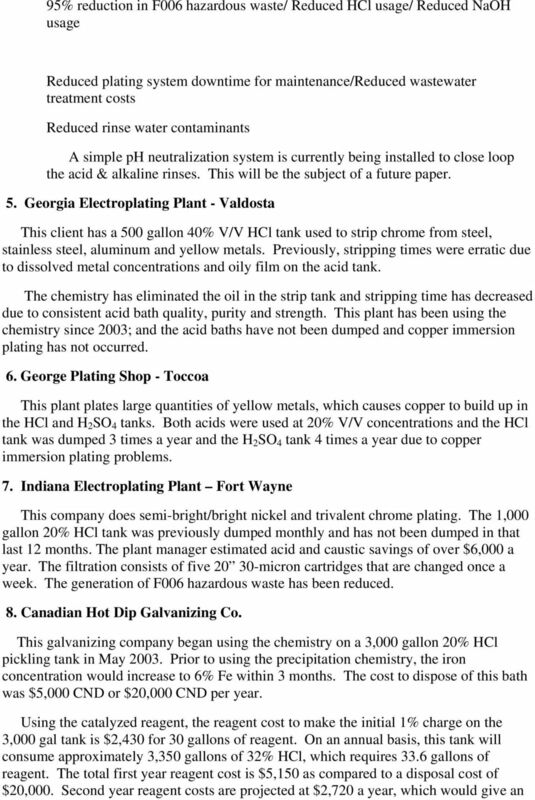 Industry uses acids for surface activation (electroplating applications), stripping (electroplating and metal finishing) and pickling to remove iron oxide mill scale (galvanizing, steel/wire). 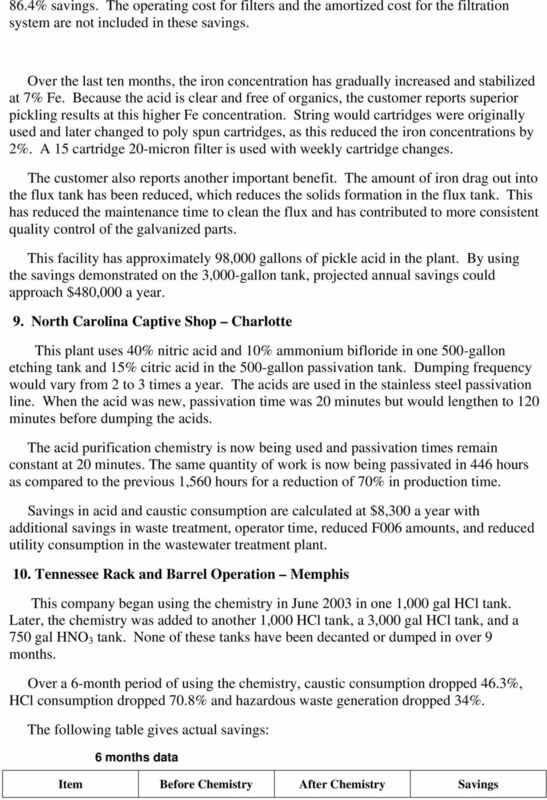 When these acids become contaminated, the acids are treated on-site or hauled off-site for disposal. This is at a substantial cost to industry. The late Dr. John Wagner devoted his professional career to the study of inorganic catalyzed reagent chemistries. His discoveries have found applications in the wood preservation industry, certain site remediation projects and in the purification of organic and inorganic acids. The focus of this paper is the application of this proprietary catalyzed reagent for the purification of acids in the metal finishing industries. The catalyzed reagent is a proprietary blend of soluble silicates, which allows for the effective immobilization of soluble metals by reacting with them to form insoluble metal silicates and insoluble oxides. Soluble silicates are a unique class of polymeric compounds in which sodium oxide (Na 2 O) is associated with silicon dioxide (Si O 2 ) generally in ranges varying from 1:1 to 1:3.22. These depolymerize in dilute solutions to form chains of silica and oxygen. With negative charges on some oxygen, reaction occurs with metal ions having positive charges to form stable, insoluble metal silicates and oxides.. Early Commercialization Gwen Wagner began marketing the chemistry in The first commercial application was at Amplate in Charlotte, NC. 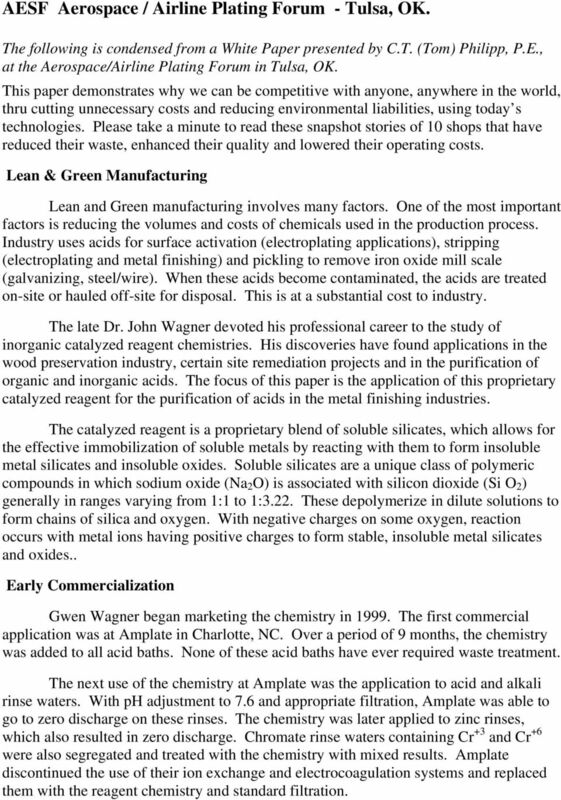 Over a period of 9 months, the chemistry was added to all acid baths. 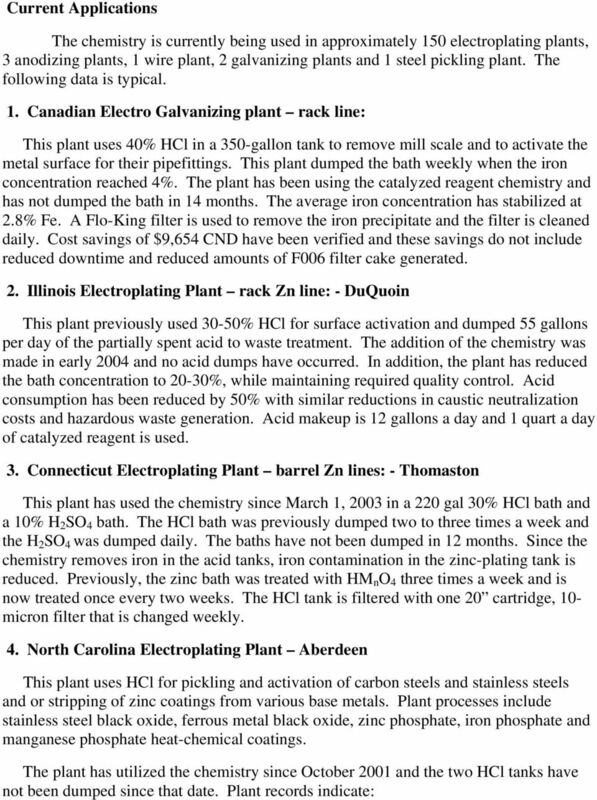 None of these acid baths have ever required waste treatment. The next use of the chemistry at Amplate was the application to acid and alkali rinse waters. 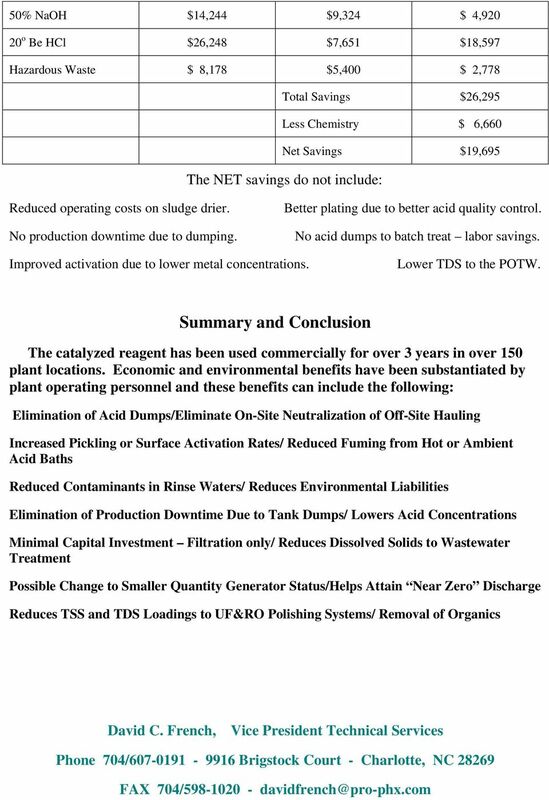 With ph adjustment to 7.6 and appropriate filtration, Amplate was able to go to zero discharge on these rinses. The chemistry was later applied to zinc rinses, which also resulted in zero discharge. Chromate rinse waters containing Cr +3 and Cr +6 were also segregated and treated with the chemistry with mixed results. Amplate discontinued the use of their ion exchange and electrocoagulation systems and replaced them with the reagent chemistry and standard filtration. Contract No: This document was prepared in conjunction with work accomplished under Contract No. DE-AC09-09SR22505 with the U.S. Department of Energy (DOE) National Nuclear Security Administration (NA). Chemical Decontamination and Fluid Handling Services Westinghouse is a global industry expert in decontamination and fluid handling processes, with proven abilities in decontamination and remediation work. Ground Water Contamination by Leachate Manoj P. Wagh, Piyush K. Bhandari, Swapnil Kurhade Assistant Professor, Department of Civil Engineering, P. D. V. V. P. College of Engineering, Ahmednagar, India. THE NATURE OF WHITE RESIDUE ON PRINTED CIRCUIT ASSEMBLIES. by: Dennis F. Bernier Vice President, Research & Development Kester. Photolithography. Class: Figure 12.1. Various ways in which dust particles can interfere with photomask patterns.